DVD Synopsis: Kevin Bacon and Fred Ward star as two country handymen who lead a cast of zany characters to safety in this exciting sci-fi creature comedy. Just as Val McKee (Bacon) and Earl Basset (Ward) decide to leave Perfection, Nevada, strange rumblings prevent their departure. 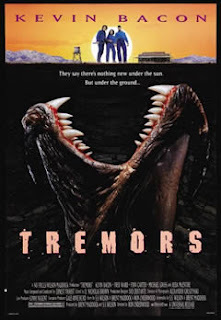 With the help of a shapely seismology student (Finn Carter), they discover their desolate town is infested with gigantic man-eating creatures that live below the ground. The race is on to overcome these slimy subterraneans and find a way to higher ground, in this enjoyable thriller co-starring Michael Gross and Reba McEntire. Val (Kevin Bacon) and Earl (Fred Ward) work as handymen for the residents of a small Nevada desert town called Perfection. Recently, the two have come to the conclusion that there’s more to life than picking up trash and cleaning out septic tanks, so they quit their jobs and set out for the big city, to seek their fame and fortune. But as Val himself will observe later on, their decision to leave Perfection came one day too late: giant carnivorous worms, which live and move underground, have cut off all the exits out of Perfection, and are preparing to make a smorgasbord of everyone in town. The population of Perfection, Nevada, is a mere 14 people; a small but diverse group of society rejects with absolutely nothing in common, yet who, together, somehow form the perfect monster-fighting team. Bacon and Ward have a great, often humorous rapport throughout the film, trying in vain to harness their limited brain power in order to concoct the perfect plan of action. They’re assisted, from time to time, in their plotting by Rhonda (Finn Carter), a geology intern who's clearly the smartest of the bunch (probably because she’s from out of town). Throw in an Asian shopkeeper named Walter (Victor Wong) and a teenage slacker (Bobby Jacoby), and what you have is a bevy of colorful characters. Yet none are quite as colorful as Burt and Heather, the survivalists whose drop from society landed them in the middle of a catastrophe. Played superbly by Michael Gross and Reba McIntire, this particular husband-and-wife team is armed to the teeth, and ready for whatever may come their way (in the film's best scene, Burt and Heather battle it out with a monstrous worm that's broken through the wall in their basement). More often than not, survivalist movie characters exist solely to be used as comedy fodder; driven individuals who talk of the end of the world, yet who are just as unprepared as everyone else when an actual threat arises. Not Burt and Heather. For them, the arrival of these underground creatures means war, one they’ve spent years training for. Sure, they’re a bit gung-ho at times, but I bet Val, Earl and the others are damn happy to have them on their side. As for the creatures themselves...well, what can I say? They defy all logic, and applying any rational thought whatsoever to their existence will bring the film’s credibility to its knees. Like the monster movies it pays homage to, Tremors demands that we suspend disbelief, and in a big way. Where did these giant, burrowing, meat-eating worms come from? Are they the result of nuclear fallout? Did they fly in from Outer Space? Maybe they're prehistoric? No explanation makes sense, but then it really doesn’t matter. The creatures, illogical though they may be, are there...and the residents of Perfection, stupid though they may be, have no choice but to deal with them. So, when you sit down to watch Tremors, take my advice: do yourself a favor and check reason at the door. This is such a fun movie! I even like the sequels in the so-called "Attack Pack". While not cinema at its finest, some great B-movie action. @Klaus: Yes, 'fun' is the perfect word to describe TREMORS. Cinematically, it may leave a lot to be desired, but as escapist entertainment it's right up there! And I haven't yet seen any of the sequels. I know Fred Ward and Michael Gross return for at least one of them, so I'll have to give them a chance somewhere down the line. One of my all-time guilty pleasures! I love it!